Accommodation : 3 cabins with 3 bathrooms, Huge salon area with cockpit, flybridge and forward deck with sunbed and specially designed seating area. 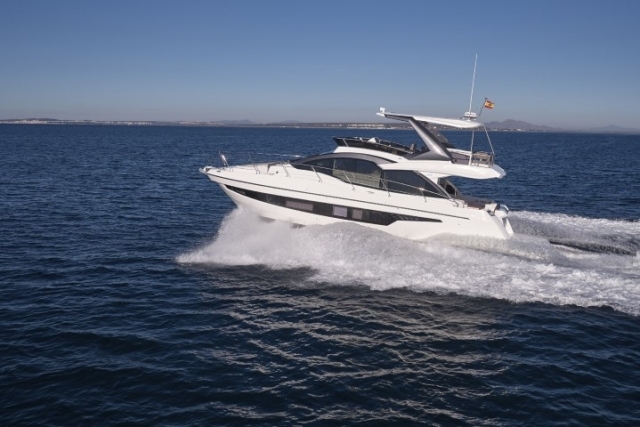 Compared to other models with a flybridge, the Astondoa 52 flybridge motor yacht is the smallest to be equipped with a large side window along the hull. Allowing natural light to enter the owner’s cabin and the transparency of the interior gives a great view of the ocean outside and creates a feeling of oneness with the sea. It also has a vertical porthole that can be opened. 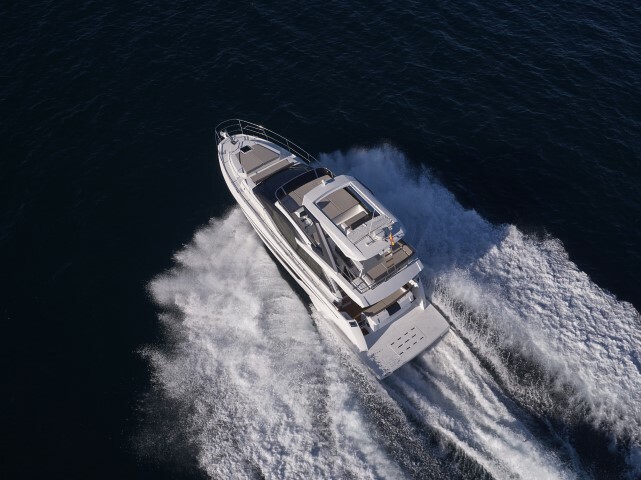 Features that stand out are the two large windows along the sides of the upper structure, the radar arch that is set back over the flybridge, and the curved shapes of the quarterdeck and fins that begin at a front point and extend back to enclose almost the entire swim platform. 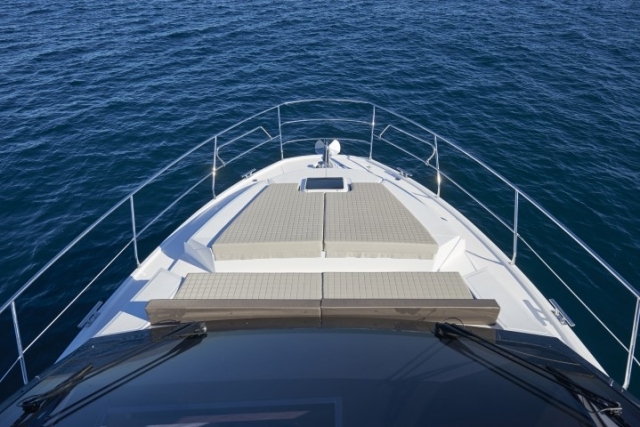 The windscreen extensions are designed to be large and to reduce overall weight. 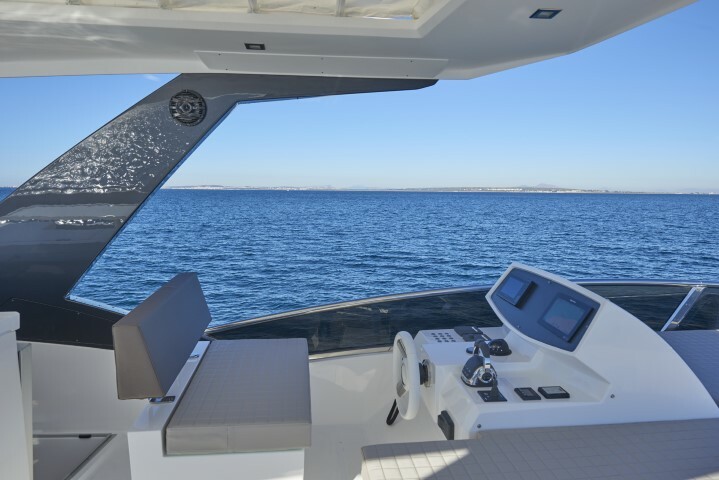 The front deck has a specially designed sunbed which is also designed to be a proper seating bench for a fun gathering while the boat is cruising. Another feature that is special is the spaciousness of the swim platform, which has a hidden extendable ladder under the port side hidden hatch. There is a large stern sofa in the aft deck along the entire transom, and the crew cabin is located below. Space engineering has been given priority in designing the systems of the motor yacht, as well as machinery that need to be maintained have been made easily accessible, which is utmost important thing for any yacht owner. The flybridge is well laid out for sunbathing and cooking, making it easy to cater to guests seated around that space, perfect for entertainment and enjoyment. There is another sunbed sofa on the starboard side so guests may accompany the skipper while cruising, or just having a great cruise. The Marvel of space engineering is in the interior. The lower deck has three double cabins, three bathrooms and a spacious galley, which seems like for a much larger yacht. 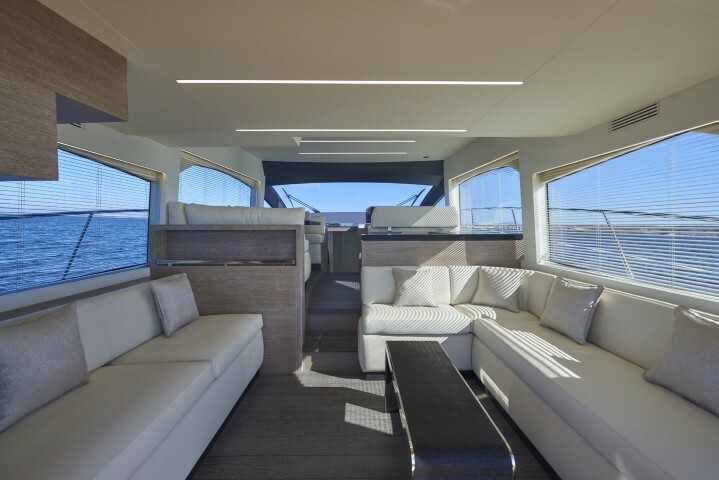 The saloon has spacious sofas on both sides with a height adjustable table in the center, and is designed for comfortable seating and for people passing by with ease. 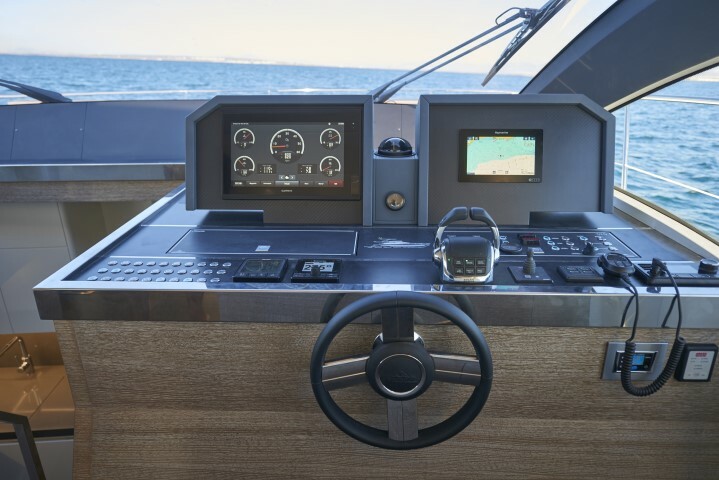 The cockpit area combines elegance with the technological feel of the carbon fibre panels that hold the equipment. The large skylights in the saloon give a beautiful and unique look to the interior. 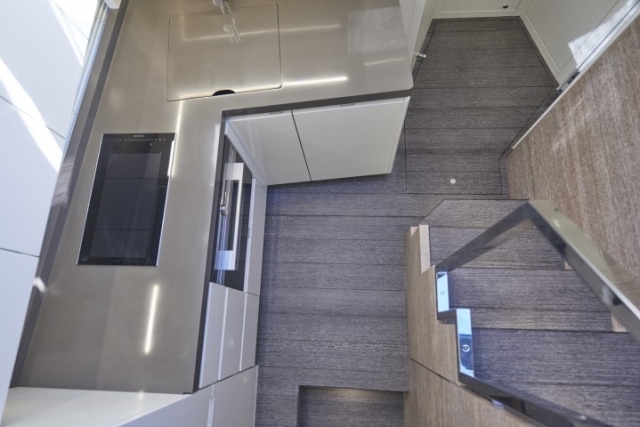 The galley is well equipped, and the steel panels used for the floor give a special touch to the design. The owner’s en suite cabin is located in the middle of the boat and includes a large double bed. 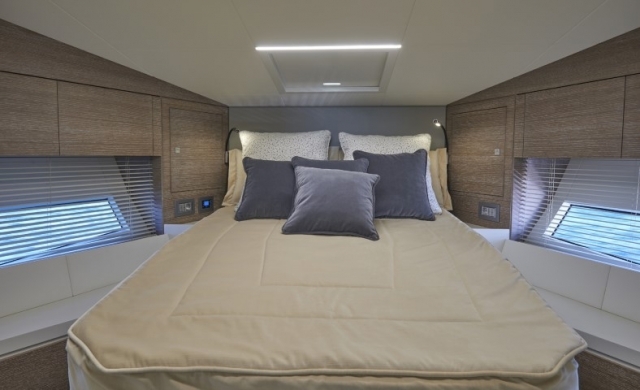 The VIP en suite cabin located in the bow is similar but slightly smaller. The second guest cabin is on the port side which includes berths. The third bathroom is also on the port side accessed via a door in the hallway.